Sometimes it is the things we don’t think we will like that end up being the very things we love most in this life. This was the case for Captain Walter, who, as a young boy, could think of far better things to do than go to a sailing camp his father signed him up to attend. His first day of camp marked the turn of the tide for Captain Walter, and today you can find him on his 30 foot sloop contentedly sailing around New York Harbor. With admiration and genuine awe, he has a way of looking at the city that you can’t help but adopt as you sit in his vessel, travelling his familiar waters. We had the pleasure of hopping aboard the Beckoned with Captain Walter, finding out exactly what he loves about sailing and chartering his boat. Check out our interview with Walter here! Tell us a little bit about yourself and how you got into sailing. How long have been doing this? I learned to sail as a child, I think I was 10 or 11, and my father informed me that I was going to a summer camp that taught sailing…and I really didn’t want to go. I had a little motor boat– a little speedy thing. I said, “Why would I want to be on one of those boring sail boats? ?” But it turned out I loved it and I have loved it ever since. But when I moved to New York I never sailed. I had kids, I raised my kids — I have four of them. All I did was make money; I lived here in the city and I worked on Wall Street. My kids went to private school and then college; all I thought about was how am I going to pay the bills and so forth. And one day I looked at the Harbor and I said, “Wait a second, look at that, this is a fantastic place to sail.” And I got my first sailboat in New York Harbor. I think that was in 1995 or something. Things just worked out. After 9/11 I moved down to this area [near Pier 40] and there was a sailing school in the North Cove Marina. I taught sailing in the harbor at that school on the weekends for about ten or twelve years. I became very familiar with the harbor and I love it. It is a great body of water to sail in. We have wind when a lot of other places around here don’t. The city generates wind. The heat from the city on a hot day causes thermal drafts and then the cool air from the ocean comes in and we have beautiful southern breezes all summer long. Plus I mean look around you, this skyline is just magnificent. What would be your ideal day on the water? The best day you can think of, what would it be? Probably a sail from Virgin Gorda in the British Virgin Islands to Anegada, and then a nice lobster dinner afterwards. It’s about 15 miles but it’s in beautiful, beautiful waters. The winds are always strong, and the sea is always gorgeous. You know the water down there is like turquoise for some reason, it has that hue to it. That would be right up there with top sailing experiences. Sailo loves the British Virgin Islands as much as Captain Walter. We have many boats available in this location along with recommendations of things to do in the British Virgin Islands. 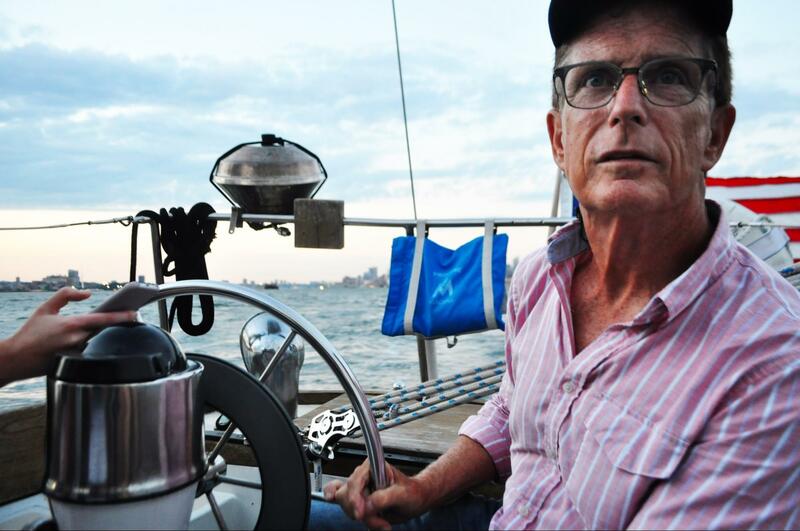 Captain Walter on his boat, the Beckoned, with the beautiful NY skyline in the background. Do you have any particularly memorable or most exciting experiences as a captain? Actually one of my most frustrating moments, and it was scary too, was I was teaching sailing in the harbor and sometimes thunderstorms come up very quickly. Well when thunderstorms that are on the front of the weatherfront come up, all of the sudden without warning, the Jersey side of the river will just vanish. They always come from the West– at least the bad ones do anyway. And when you see that happen, you’ve got about two minutes to get your sails down, and if you don’t get them down…well God help you. So I was teaching sailing to these three newbie sailors and all of the sudden I noticed the storm coming in and I sent them below and told them to put life jackets on. They went in the cabin. 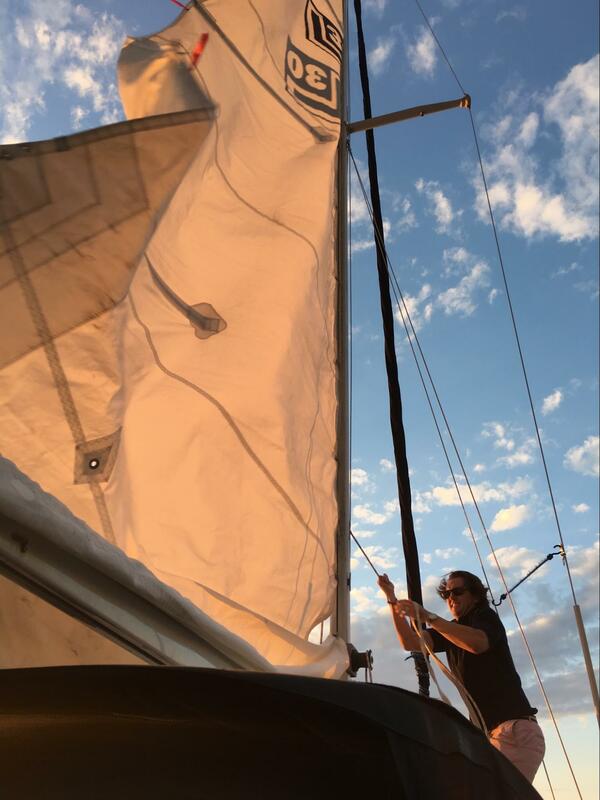 I got the jib down and laid it on the deck and then I got the mainsail down. There was an outboard motor on the back of the boat, I started that, and I noticed that coming down the harbor was the big steam ship the Queen Elizabeth. I saw that it was coming down, but I wasn’t too concerned about that because I had the motor on and I was staying out of the way. What happened next was this freak thing. The wind from the storm hit and it was about 50 mph. And it somehow got underneath the jib that was lying on the deck. And the jib had become disconnected from the cleat that held it down and the whole thing went up to the top of the mast. It created so much wind resistance that the boat tipped way over to the side. I could hear the students’ bodies hitting the bulkhead down below and it lifted the outboard out of the water. And now I was in the channel and the Queen Elizabeth was coming down and I was like, “My God, I can’t get out of the way now.” And that fear lasted a very short while. The boat turned around, the sail came down off of the mast, and we did what we needed to do to get out of the way. But in that moment, I gotta tell you it was a bit scary. The Beckoned, chasing down the last remnants of the sunset in NY harbor. 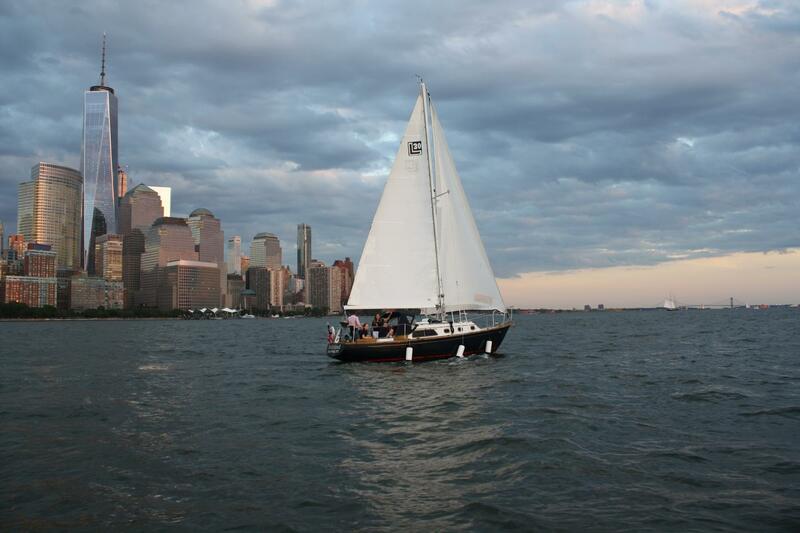 What is your favorite itinerary for people chartering a boat in NYC? It depends how long they are chartering the boat for. If someone just wants to be out for three hours and then have dinner, I’ll take them to the Statue of Liberty, Ellis Island, we will go around Governor’s Island, and we will see the skyline at sunset if possible. Then we will have a little time after sunset as the city lights up and the sky darkens. That would be for a short cruise. For a full day I love taking people up the East River to the Long Island Sound and going up to Larchmont and maybe watching the sailboat races there or stopping in Port Washington. People have lunch at Louie’s seafood restaurant– sort of a famous place, and there’s a great beach around there where we just anchor and go swimming. Some people even like to go and have a picnic. We barbeque right here in the cockpit, that’s it right over there. There’s a little stove down below, it’s well equipped. It’s got a little kitchenette, coolers, and it even sleeps four people. Sometimes I do overnights as well. If you like Captain Walter’s itinerary for an NYC boat trip, also check out our New York Attractions By Boat. If you could sail anywhere in the world, someplace you have never been, where would you go? I’ve actually sailed in a lot of places. I have this thought that I would like to sail from New York to Bermuda and back. And one day I will do that, but I have not done it yet. I was supposed to sail back from Bermuda a couple of years ago but the weather was so bad that I flew to Bermuda and met the guys who had the boat and we couldn’t leave. We waited and waited and the weather out-did us, it never let up. A couple of boats left against advice, one sank and the other was damaged. It was rough out there. That Bermuda Triangle…it’s not a myth actually. Sail’s up on Captain Walter’s boat. Captain Walter’s sailboat is perfect for a family sail, a romantic date, or a family outing on the water. To learn more about his boat or to book a trip, click here. Walter’s partner Captain Matt, located right in the New York area, also has his boat listed on Sailo. To check out his boat and book a trip, click here! 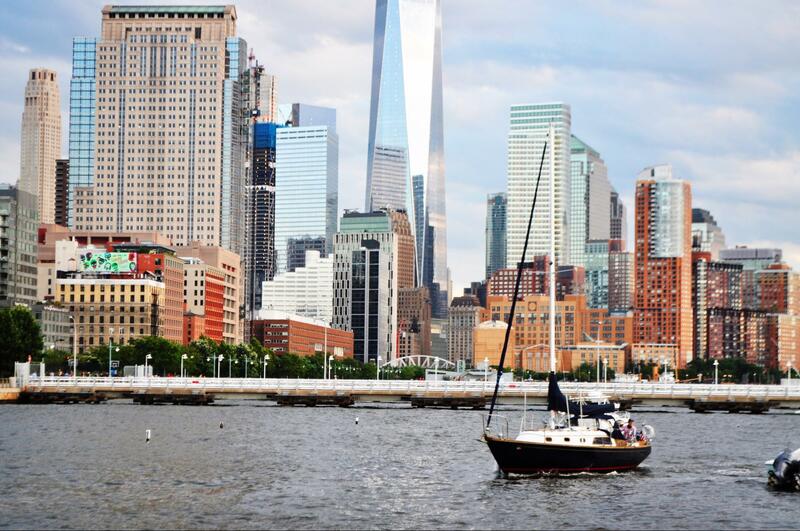 There truly is nothing like a sail through New York City.